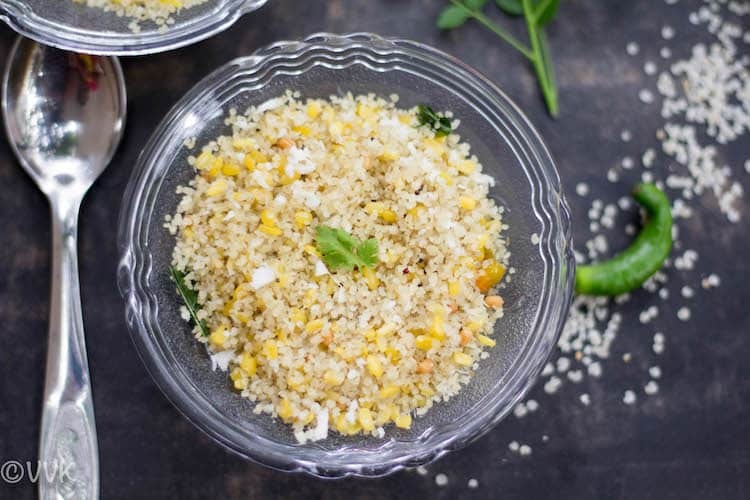 Millets, with high nutritional value and fiber content, are gaining their popularity back again. 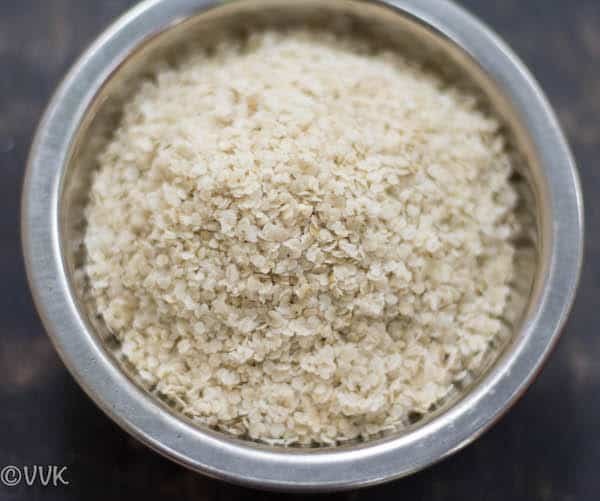 Be it Little millet or foxtail millet or barnyard millet or kodo millet or the finger millet, each has its health benefits, and each of them provides the essential nutrients to our regular diet. Looking for where to buy these millets regularly in a hassle free way? The answer is Native Food Store. 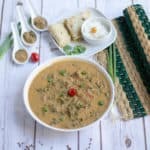 They have a broad range of millet products, and that includes not only the millets but also all the millet flakes/aval, millet noodles (comes with tastemaker), instant millet mixes and other traditional products. 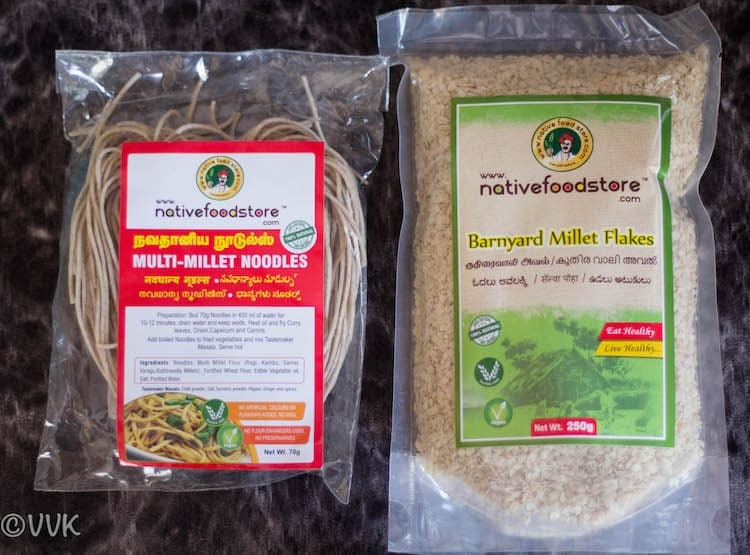 When I got an opportunity to try their products, I happily agreed, and they sent me barnyard millet flakes and multi millet noodles. The price. The price is very reasonable. 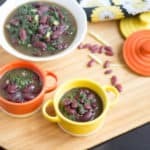 Love the package, and each package comes with a recipe(I went with our traditional family recipe though) and also with instructions on how to use the product. Love the website navigation, and it’s straightforward to use, and also they have all their policies stated clear. 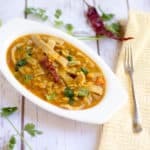 Soak the moong dal in water for at least 1 hour. Then drain the water and set aside. 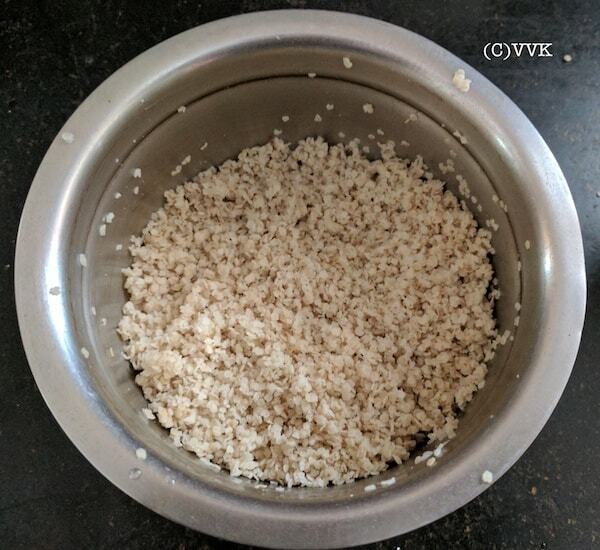 Sprinkle some water (atleast 1/4 cup) over 1 cup of barnyard millet flakes and mix well. Let it sit for 7 minutes. Once the oil is hot, add the mustard seeds, urad dal, hing, curry leaves and broken green chilies. 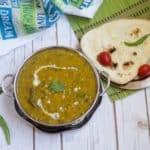 Then add the drained moong dal and salt. Now add the barnyard millet flakes and mix well. Sprinkle some water and let it cook for two to three minutes. Then add the grated coconut and mix well. Turn off the heat, and that’s it. 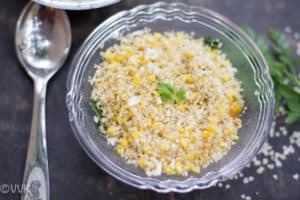 Simple yet delicious barnyard millet flakes upma is ready. 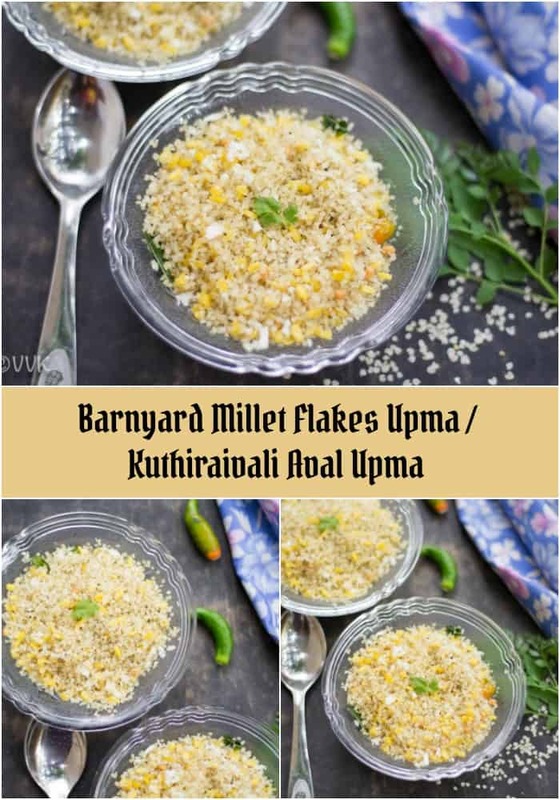 Instead of drizzling water over barnyard millet flakes, you can soak the barnyard millet flakes in water and if you are soaking it thoroughly, then drain the water after 3 to 4 minutes. Do not let it soak for more than 5 minutes. If not the upma will be sticky. 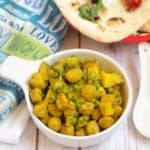 Moong dal is completely optional. But it adds nice texture and crunchiness to the upma. A bit of protein is always good. 1 tbsp of coconut oil is on the higher side, but it adds nice fragrance and doesn’t let the upma go dry. If you are serving immediately, you can reduce the oil. Also instead of coconut oil, you can use oil of your preference. 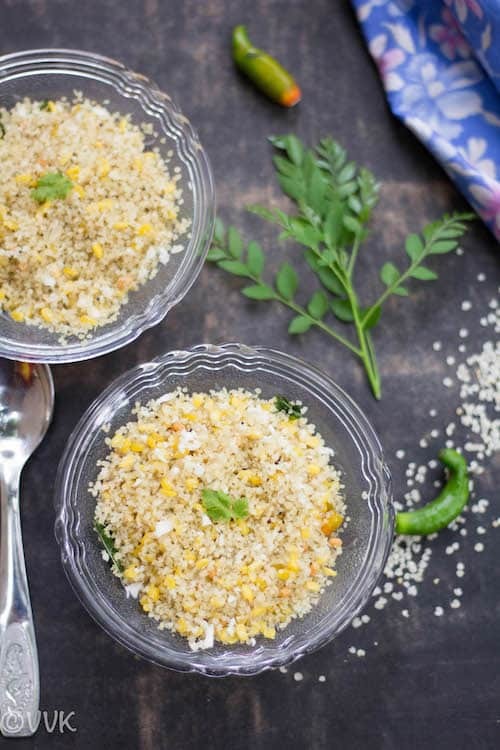 A healthy and delicious upma prepared with barnyard millet flakes and moong dal. Sprinkle some water (latest 1/4 cup) over 1 cup of barnyard millet flakes and mix well. Let it sit for 7 minutes. 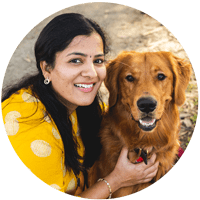 Instead of drizzling water over barnyard millet flakes, you can soak the barnyard millet flakes in water and if you are soaking thoroughly, then drain the water after 3 to 4 minutes. 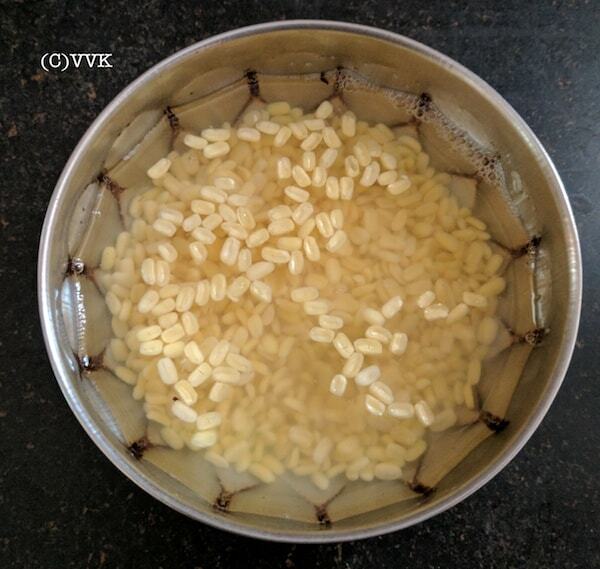 If not the upma will be sticky.